Durable and efficient commercial laundry machines are crucial at universities and college campuses across the country. And, with the help of Commercial Laundries, finding the right Orlando campus laundry solutions that can stand up to the rigors of consistent, daily use is easy. Our affordable, top brand card and coin operated commercial laundry equipment benefit both you and your school’s students. Users have access to effective washers and dryers that allow them to launder their clothing quickly and effortlessly, while you integrate a profitable, ongoing stream of revenue for your business. Not sure where to start regarding Orlando campus laundry solutions? Commercial Laundries is happy to come alongside you. Leasing commercial washers and dryers comprises a large percentage of our business. Our skilled team members can help you create a strategy that designs your onsite laundry facility for maximum usage depending on your available space. By taking into account your budget, needs, environmental aspects and other factors, we will help you outfit and customize your onsite college laundry equipment area. When you decided to move forward with integrating an onsite commercial laundry area into a college campus or university, you will have a few decisions to make regarding equipment. For starters, consider if purchasing or leasing equipment is the right choice for your budget. Leasing allows you to outfit an Orlando commercial laundry space quickly without a large outlay of money. Plus, at Commercial Laundries, all of our lease customers receive free regular service and maintenance on their equipment for the lifetime of the lease! This ensures all washers and dryers are working at peak performance and your customers are getting efficient, durable machinery to use every time. Next, determine if you prefer card or coin operated Orlando academic laundry equipment. Both card and coin operated washers and dryers have a variety of benefits and options. For customers who select coin operated equipment, you will be happy to know that our machines come with large capacity coin vault storage, which will minimize your collection time, and have theft deterrent construction plus safeguards against foreign coins and slugs. Card operated Orlando campus laundry solutions and college campuses offer ease of use through the swipe of a Smart Card. Students upload funds onto their Smart Card through the Clean Pay kiosk installed in your facility. This can help keep the facility safer as less cash and coin are on hand, plus through automation from the kiosk, bookkeeping will be a breeze come tax time. Want a High Functioning and Profitable Orlando Commercial Laundry Space? Choose a high traffic, easily found and accessible location to create your laundry facility. 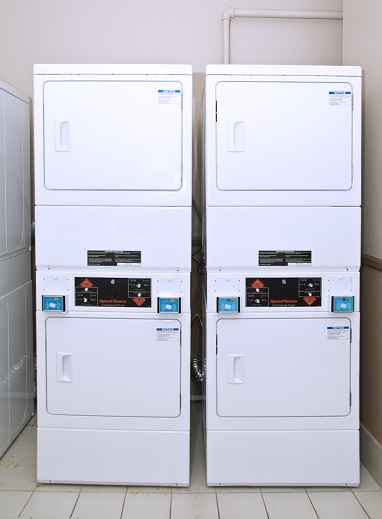 Depending on the layout of your campus, this could mean one main laundry facility, or smaller spaces located in each dormitory. Students and their parents will want to know the onsite laundry facility is a safe space. Provide a well-light area that is cleaned and maintained daily, with easy to see trash receptacles and exit areas. Add fun to the facility. Even with the newest, quickest machines, there is a wait time when completing a laundry cycle. Consider adding free Wi-Fi so students can complete assignments on their laptops. Also, think about adding vending machines, televisions, and a variety of seating options. Save on water, gas, sewage and electricity, while also providing students with the most efficient machines when you choose washers and dryers made with the latest technology. When you need Orlando College Campus Commercial Laundry machines for lease or purchase, call Commercial Laundries. Let us help you customize your onsite laundry area and make it a profitable and enjoyable endeavor.